Literary North is excited to be the Community Partner for the film To Keep the Light, which is showing at the White River Indie Film Festival on Saturday, June 3 at 4:00 pm. A Q&A session with producer Jane Applegate will follow the screening. For more information about the film, to view a trailer, and to buy advance tickets, see our our blog post about the film. We're working on the final details for our own Poetry & Pie event, which will be held on Saturday, July 29, from 2:00 to 4:00 pm at Sweetland Farm in Norwich, Vermont. In addition to readings by three fabulous poets—James Crews, Dede Cummings and Mary Kane—we've asked our friend, poet Taylor Katz, to join us by writing original poetry for attendees, and we've contacted our expert baking friends to supply us with some of the best pies you'll find anywhere in the Upper Valley. For all the delicious details, please visit our Poetry & Pie event page. We can't wait to see you there! Page Burner Reading Series - June 1 at ArtsRiot in Burlington, Vermont. Authors include Jensen Beach, Sandra Beasley, David Hicks, Alexis Page, and Angela Palm. Bread Loaf Orion Environmental Writers' Conference - June 3 to 8 at the Bread Loaf Campus of Middlebury College in Ripton, Vermont. Authors include Megan Mayhew Bergman, Camille T. Dungy, John Elder, Ross Gay, Ted Genoways, Robin Wall Kimmerer, and Joe Wilkins. Bread Loaf Translators' Conference - June 3 to 8 at the Bread Loaf Campus of Middlebury College in Ripton, Vermont. Author/translators include Maureen Freely, Jennifer Grotz, Suzanne Jill Levine, Christopher Merrill, and Idra Novey. The Thing in the Spring - June 8 to 11 at the Toadstool Bookshop in Peterborough, New Hampshire. Events feature author readings preceded or followed by brief concerts. Authors include Alexandria Marzano-Lesnevich, James Crews, Wo Chan, Rebecca Bengal, Matt Krefting, Charles Simic, Cristian Flores Garcia, and Zach Green. Authors at the Aldrich - June 14 to August 16 at the Aldrich Public Library in Barre, Vermont. Authors include Angela Palm, Melanie Finn, Dana Walrath, Tanya Lee Stone, Nicole Grubman, Nicole Birkholzer, Adam Krakowski, Kekla Magoon, Thomas Christopher Greene, and Catherine Donnelly. Joan Hutton Landis Summer Reading Series - June 11 to September 3 at BigTown Gallery in Rochester, Vermont. Authors include Rosamond Purcell, Robin MacArthur, Annie Kim, Russell Leong, Major Jackson, Didi Jackson, Paula Marcoux, and Mark Bowen. Hyla Brook Reading Series - June 16 to September 14 at the Frost Farm in Derry, New Hampshire. Authors include Rhina P. Espaillat, David R. Surette, Jenna Le, and Meredith Bergmann. Please visit our calendar for detailed information about each event and to see more event listings for June and beyond. Ann Beattie will be reading at the Harvard Bookstore in Cambridge, Massachusetts on Tuesday, June 27 at 7:00 pm. This event is free. 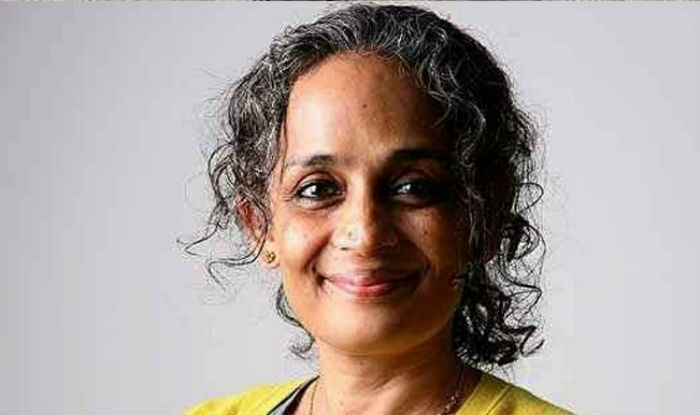 Arundhati Roy will be reading at the Old South Church in Boston, Massachusetts on Tuesday, June 20 at 7:00 pm. Tickets are $5 for general admission only, or $29.75 for admission plus book. The Juniper Summer Writing Institute public readings series is from June 18 to June 25 at the University of Massachusetts in Amherst, Massachusetts. Each evening at 7:30 pm, faculty and writers in residence read from their new and selected work. This year's series features Dorothea Lasky, Joy Williams, Dara Wier, Tiphanie Yanique, Arda Collins, Nathan Hill, Amy Leach, Lydia Millet, Arisa White, Timothy Donnelly, Rachel Glaser, Sam Michel, Camille Rankine, Stephan Graham Jones, Paul Lisicky, and Harryette Mullen. Also worth a drive plus a ferry ride, the 2017 Nantucket Book Festival, June 16 to 18, in Nantucket, Massachusetts, features readings, panel discussions, luncheons, book sales, and other events with an array of authors, from Laurie Halse Anderson to James Gleick to Alice Hoffman to Ruth Reichl. Most readings and events are free. For more information, visit the Festival website. The Green Mountain Writers Conference (July 24 to July 28, in Chittenden, Vermont) has discounted registration rates if you register before June 15 (lesser discounts are also available if you register before July 15). For more information, please visit their Registration page. There's still time to register for the Writers' Workshop at Exeter (June 25 to June 30), in Exeter, New Hampshire. This conference is open to anyone who wants to write and discusss writing in a nurturing Harkness workshops setting. The conference is open to all skill levels and anyone who writes or wants to write poetry, fiction, and creative nonfiction. For more information and to register, please visit the Conference page. Bahuan Publishing is accepting submissions for the 2017 May Sarton New Hampshire Poetry Prize. The submission deadline is Friday, June 30. For more information, please visit their submission page. The Hopper literary magazine from Green Writers Press is accepting submissions of full-length poetry manuscripts to its 2017 Hopper Poetry Prize. This contest is open to poets with an identified interest in the natural world and whose work explores issues tied to our ever-changing environment. There is an entry fee of $25. The submission deadline is Saturday, July 1. For more information, please visit their Contests page. Register now through August 31 for the Northern Woodlands Conference (October 20 to 22, 2017) and take 10% off the registration fee. Use the special code EarlyBird at checkout to receive the discount. For more information and to register, please visit the Conference page. Registration is now open for the Writers in the Round Songwriters and Poets Retreat, September 7 to 10, on Star Island, New Hampshire. This is a time for stretching boundaries, cross genre inspiration, and fresh salt air. We welcome all levels of artistry for daily classes, structured and unstructured time for composition and collaboration, small group workshops, and nightly song and poetry swaps. The program fee is $110. Room and board rates ($424 to $734) include lodging, meal, and ferry transportation from Portsmouth, New Hampshire. For more information and to register, please visit the Retreat page. Join poet Partridge Boswell for a three-session workshop, To Revision and Beyond! A Poetry Craft workshop on Mondays, June 5 to 19, at Burlington Writers Workshop in Burlington, Vermont. This workshop series will revise your perceptions of re-vision, daring to post the questions: When is a poem truly finished? Is it possible to love revision as much as the original writing of the poem? Covering a checklist of revision tests or thresholds, our sessions will move from the final stages of “completing” (or as Auden says “abandoning”) a poem to pursuing its dissemination—culminating in the final test of tests (aside from submitting for publication): performing poems for a live audience! For more information or to register, please visit the Registration page. Poet Polly Giantonio is teaching a four-session workshop, Naked Writing: The Soul's Story in June. Participants will meet Wednesdays, June 7 to 28, from 10:30 am to 12:30 pm at the Kilton Library in West Lebanon, New Hampshire. Find and nurture the seeds of your story. Learn what makes your writing strong, memorable, and effective. Polly has taught poetry and writing at local universities, has mentored students of all ages, and developed and co-facilitated workshops on creativity and poetry. For more information and to register, please call (802) 693-0015. Join the Burlington Writers Workshop for a Flash Fiction Workshop on Wednesday, June 14, in Burlington Vermont. In this workshop, three or four writers will read their work aloud to the group; the group will then offer on-the-spot feedback to each writer. For more information or to register, please visit the Registration page. In conjunction with photography exhibit, The Everyday Fantastic, the Hood Museum of Art will host a Writing About Photography workshop on Thursday, June 22, from 6:30 to 8:00 pm, at the Hood Downtown in Hanover, New Hampshire. Using discussion and creative writing exercises, the workshop will explore the photography of Julie Blackmon. All writers welcome. Enrollment in this workshop is free, but limited. For more information and to register, please visit the Event page. NatureCulture: An Introduction to Nature Writing and the literature of Environmental Justice with Sierra Dickey and Anna Mullen, at the Writer's Center in White River Junction, Vermont. Want to write as thoroughly as Thoreau? As daringly as Dillard? This intro to nature writing will put you on the path! We’ll lead you through a cliff notes version of the American nature writing canon, investigate key tropes and approaches to writing about the nonhuman world, and do generative exercises to get words on the page. Our driving question will be: how can words illuminate and bring about intimacy with landscape, and bring us closer to organisms and organic matter rather than farther away from them? $25. Saturday, July 1, from 10:00 am to 5:00 pm. For more information or to register, email dickey.sierra@gmail.com or acm2525@gmail.com. Poet James Crews is teaching a "Mindfulness and Writing" workshop on Saturday, July 15, from 10:00 am to noon at the Northshire Bookstore in Manchester Center, Vermont. For more information and to register, please visit the bookstore's Event page. There's still time to register for The Center for Cartoon Studies 2017 Summer Workshops. In addition to workshops for drawing and writing cartoons and comics, this summer's schedule includes three graphic novel workshops led by journalists, writers and cartoonists Josh Kramer, Em DeMarco, Paul Karasik, Jo Knowles, Tillie Walden, and Melanie Gillman. For more information and to register, please visit their Summer Workshops page. The application deadline for the Poetry Seminar at The Frost Place is Thursday, June 29. For more information, please visit their Application page.